From the position of assessing the political situation developing in the APR, the character of the next commemoration for the victims of the Nanjing Massacre in China is of interest. Since 2014, this event was designated to be officially to be carried out on December 13. It was this day in 1937, that it began and continued according to different estimates from three weeks to one and a half months, one of the darkest events of the Second Sino-Japanese War, which two years later became a composite part of the Second World War. On December 13, 2017, the 80th anniversary of the Nanjing tragedy took place and, therefore, the format of the holding of official events by the leadership of the PRC on this occasion acquired special significance. Apparently, this time they had a rather modest, really commemorative character. During the mourning ceremony, the presence of a tension factor in the current relations between the two leading Asian powers was not visible. Xi Jinping, the leader of the PRC, attended it, but did not address the memorial speech delivered by Yu Zhengsheng, member of the Standing Committee of the Politburo of the CCP Central Committee (http://www.globaltimes.cn/content/1080144.shtml). The words of the latter about “the Chinese and Japanese peoples, which should safeguard a difficultly won peace and also make unremitting efforts to avoid the recurrence of such tragedies in the future” are noteworthy. Groups of ethnic Chinese highlighted the deplorable date in a range of other countries. The Parliament of the Canadian province of Ontario (the most populous) a month before adopted a special document in memory of the Nanjing Massacre. Juding by the description of the witesses of what happened 80 years ago in the capital of the Republic of China, it was really one of the most massive crimes in the ‘rich’ chronicle of like events in the Second World War. Estimates of the number killed in the assault on the city in the resulting subesquent depredations by soldiers fluctuate bounds of 40 to 300 thousand. As a consequence, 20 thousand women were subjected to violence. There are different opinions about the reasons for the ‘brutality’ in Nanjing of Japanese servicemen: the difficult course of the war (which was not, as was supposed to be a walk in the park), the great losses during the previous battle for Shanghai, the loss of control and criminal orders of the senior commanders of the Japanese army, attempts of Chinese soldiers (disguised in civilian dress) to ‘get lost’ among the civilian population of the city. Be that as it may, the Nanjing Massacre has become one of the main items in the list of charges of war crimes brought against the defendants in the post-war tribunals in Tokyo and Nanjing itself. 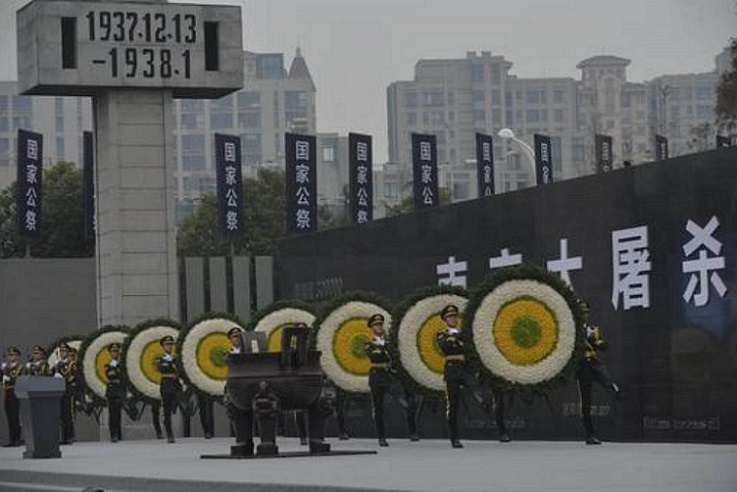 The Nanjing Massacre remains one of the most sensitive moments not only of the past, but in the current state of Sino-Japanese relationship, in which without ‘history’ there are enough problems. Moreover, it can be confidently asserted that the very current acuteness of the factor of the negative but already quite remote “history” is essentially a consequence of the complexities of actual relations between the two leading Asian powers. ‘Historical Revisionism’ on the question of causes and the course of the war in Japan and in the Pacific Ocean, peculiar to the current political elite of Japan headed by Prime Minister Shinzo Abe, also does further reduce of the magnitude of the Nanjing Massacre factor. Like other negative facts of that period, for example, the problem of ‘comfort women’. In Japan, if they do not deny it in full, they consider it an “unfair exaggeration” of the events connected to them. Let us recall that at the end of 2016, the Japanese government suspended financing for UNESCO after the organization included in the World Heritage List a file of documents on the Nanjing Massacre given by Beijing a year earlier. On the eve of this lamentable jubilee there were published several new documents (hich corroborate the reality of what happened 80 years ago in Nanjing. It can be said that on December 13, 2017, Chairman Xi did his part to meet Japan and its up to the prime minister. In general, the format of the last memorial event in Nanjing seems to be a positive signal of Beijing towards Tokyo. Evidence of the preservation of the current mood in the Japanese political elite of elements of ‘historical revisionism’ was the decision of the Tokyo branch of Supreme Court of Japan on December 15 this year ) of a relatively no less gloomy event, called the bombing of Chongqing, which was occurred during the period 1938-1943. The number of civilians who died in the temporary capital of the Republic of China is also estimated at tens of thousands. The Supreme Court, while not denying the very fact of the bombing of Chongqing, confirmed the lower court’s decision to refuse to meet the demands for apology from the government and compensation to the victims who have survived to this day. Finally, with some caution, we can state a decrease in the degree of intensity of the ‘historical’ theme in Sino-Japanese relations. If we really observe the process of moving the problem of the Nanjing Massacre from the space of political relations between China and Japan to the sphere of reasoned scientific discussions, this is undoubtedly a positive trend in the overall picture of the development of the situation in the APR. This fits into the general trend of recent times, caused by the attempts of both leading Asian powers to find some compromise in the field of competing projects (TTPs and VShP) aimed at building multilateral economic configurations. At the same time, the trends of the negative plan have not disappeared, mainly related to the sphere of ensuring security. However, the latest noteworthy facts in this area (draft defense budgets of Japan and the US for 2018, the PRC military exercises around Taiwan, and some others) deserve special comments.